This example was created on March 1, 2017. This is NOT a valuation, forecast, rating, or recommendation; rather, it is a teaching example. What follows is NOT investment advice; rather, it is a teaching example. It is intended only as academic information to those who want to learn about valuation. It should not be construed as the basis for any valuation or investment. The information in this presentation came from various sources that we believe are reliable, though we do not guarantee the accuracy, adequacy or completeness of such information. We hope you enjoy learning about valuation as much as we do! IHH Healthcare Berhad is a prominent health-care services provider in Asia, Central and Eastern Europe, the Middle East and North Africa. By market capitalization, it is the second largest listed healthcare operator in the world. With more than 30,000 employees globally, IHH operates across 10 countries and has close to 10,000 beds in 52 hospitals. IHH has three subsidiaries: Parkway Pantai, Acibadem and International Medical University. Parkway Pantai is the group’s largest subsidiary. It is spread across Singapore, Malaysia, Brunei, India and China. It is the largest private healthcare provider in Singapore and the second largest in Malaysia. IHH holds a 35% stake in Parkway Life (PREIT SP), a healthcare real estate investment trust with 47 properties, and a 10% stake in Apollo Hospitals (APHS IN), a broad network of facilities mostly in India. We can see the revenue breakdown with 61% coming from Parkway, the main contributor. In this case, we can see that the company has had an increasing revenue growth rate of 9%, 15% and then 21% over the prior three years. We always want to be careful when a company is in an acceleration phase, because it may not continue forever. In fact, look at net profit growth. It went from 19.5% to 24% to 56%, which is massive. Also we can see that the net margin has increased to 14%. If we just blindly forecast that forward, we could end up with a 20% net profit margin by the time we get to 2021. But I think we have to be careful, look at competitors and try to understand what type of profit margin is sustainable for the business. The forecast is that growth will slow down slightly and that net margin will gradually descend to 12.4%. We can see that for this company, we’re expecting asset growth. It’s a bit lumpy, but asset growth is always lumpy. In this case, we’re forecasting that the net fixed asset growth is going to fall quite substantially down to 3.7%, and the total asset growth is going to be about 6% to 7%. I like to look at the revenue per asset. We can see that it’s been rising here, and I expect it to rise slightly going forward. If we look at the liabilities of the company, we can see that the dividend payout ratio of the company is rising from 24% to about 33%. 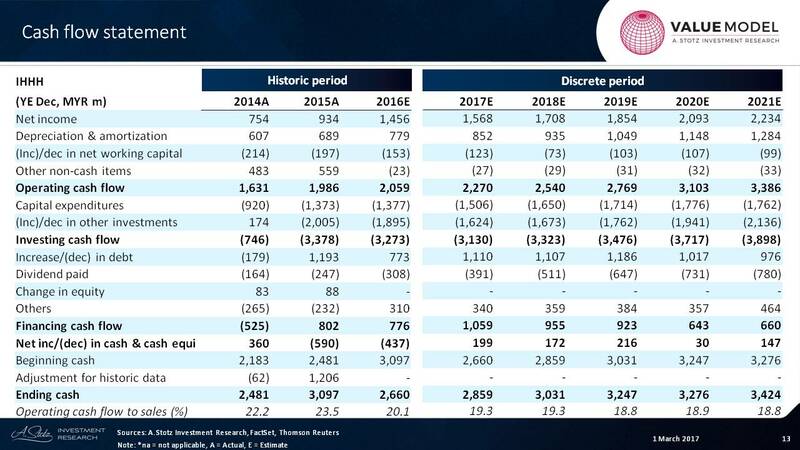 If we look at the cash flow statement, we’re going to see that the operating cash flow is very strong. 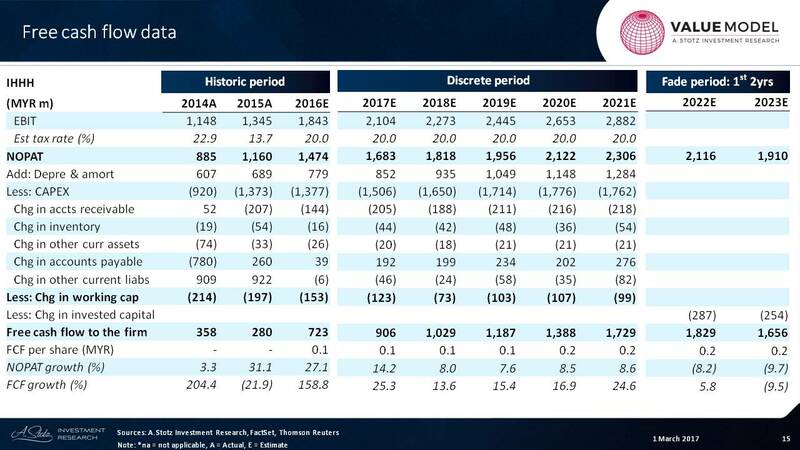 CAPEX is going to continue to be high, and the net working capital is a small investment for the company. Let’s look at the next subject, which is the absolute valuation we get from these forecasts. Now, we’re going to look at what are the important items for me: the NOPAT, our forecast and the fade period. You can see that that’s fading down from a very high level. 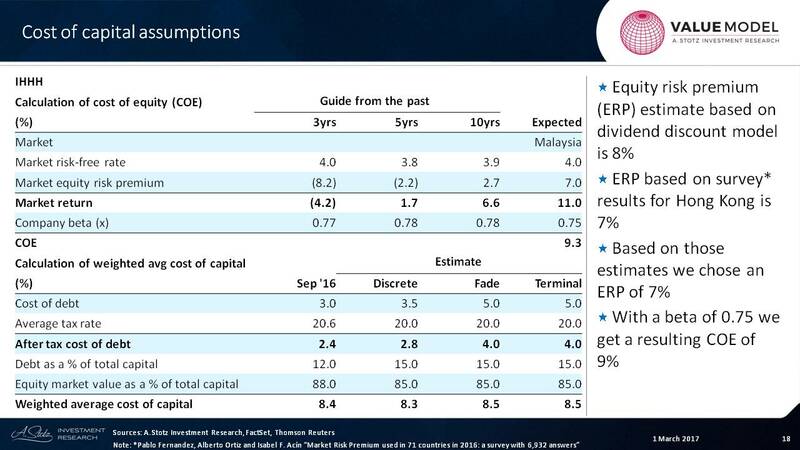 And I look at the amount of CAPEX, which we looked at in the cash flow statement and the change in working capital. Those are the major items. From that, I can see that free cash flow to the firm has been rising, and I think it will rise further. But eventually that free cash flow to the firm will start to slow down and even start to fade, which we’ll look at in a second. The return on invested capital has gone from 11% to 14% to 15%, so the company is growing its invested capital slowly compared to its profit growth. I don’t see a reason why that can’t continue for a while, but eventually in the fade period it’s going to fall. Now we can see that the growth rate in the EPS is 7%, 12% and 13%, and the growth rate in dividends per share is going to be slightly higher this year, because we’re continuing to increase ? and that will drive strong dividends-per-share growth. When we look at the cost of capital assumptions, we’ll see that the main concern here is that the equity risk premium estimate, based upon dividend discount model, is about 8%. Based on survey results, 7% is what I’m going to estimate. Remember, this is from now until eternity, so we have to be careful about the assumptions that we make. We don’t want to make extreme assumptions or else we’re going to have extreme values. For the end result, I’m going to pick a beta of about 0.75, and that’s going to give a cost of equity of about 9%. There is a 20% tax rate where the company gets some tax shield help when it borrows money, but it doesn’t borrow much ? only about 15%. The weighted average cost of capital is pretty close right there. 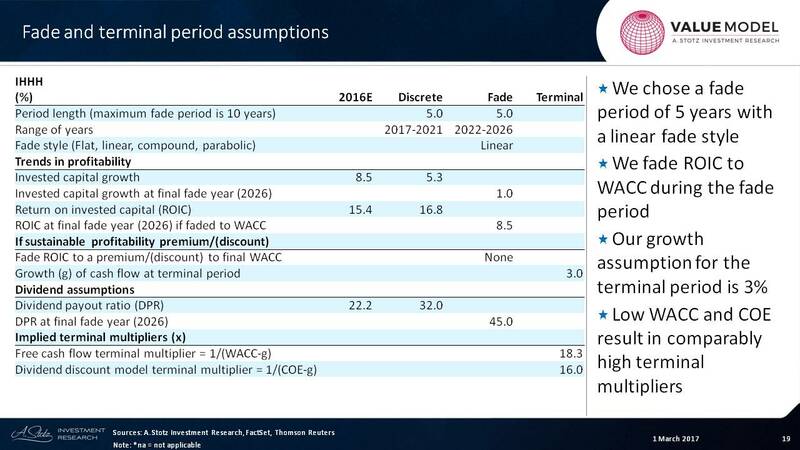 Now, if we look at the fade, I’m predicting there’s going to be a five-year fade period and that the return of invested capital is going to fade down to the weighted average cost of capital. This means that there is no premium or discount and that the terminal value growth rate is about 3%. Now, let’s take a look at what we find from an absolute valuation. What we see from this is a range of values from 1.6 all the way up to 4.3. 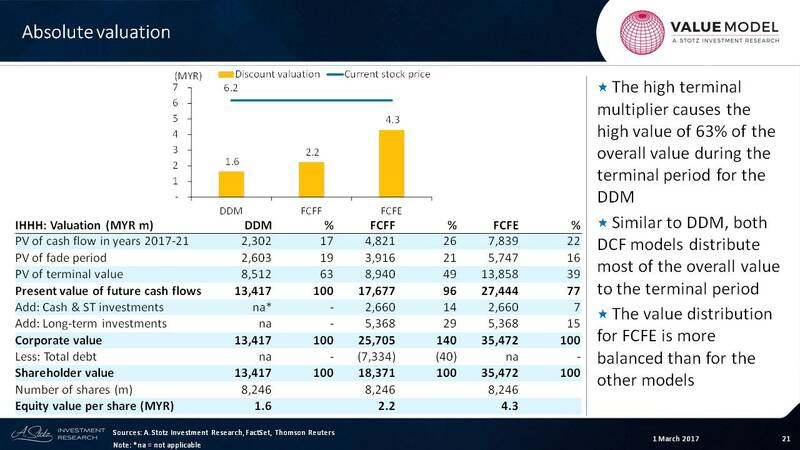 Most of the value is in the terminal value for the dividend discount model, but if we look at free cash flow to equity or free cash flow to the firm, it’s less the case. Under a relative valuation scenario, the PE ratio is what you pay in price for one in earnings. It is a simple and commonly used measure. 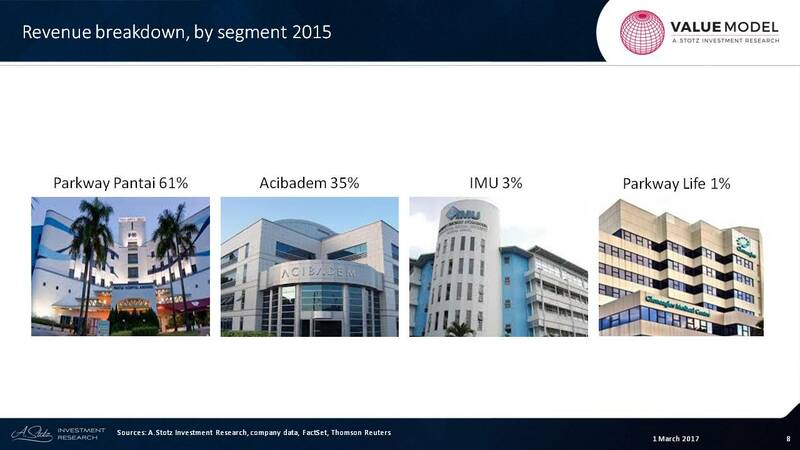 We compare a company against its sector in its own country, its region and its sector worldwide. We did have absolute values of MYR 1.6; MYR 2.2 and MYR 4.3, so MYR 7.6 is pretty massive. 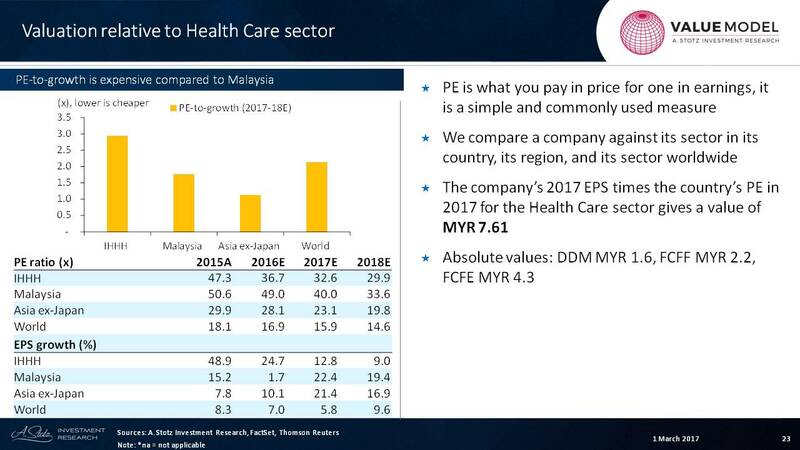 We can see that the PE ratio is about 40 times earnings for the industry. And so, if we take this type of calculation, we’re saying that it would be a rerating. But why would there be a rerating when the profit growth is higher for the industry? These are questions that you’d want to answer as you go through your valuation. 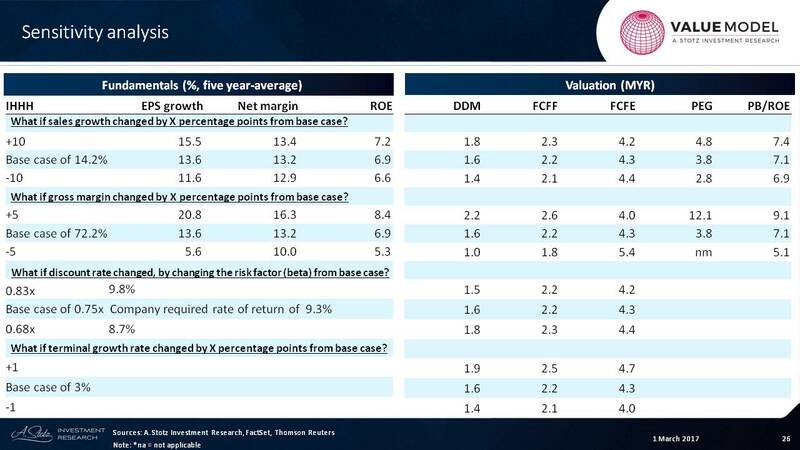 Now, let’s move on to the price-to-book valuation, which is especially useful for firms where assets are the core driver for earnings or where earnings are volatile. 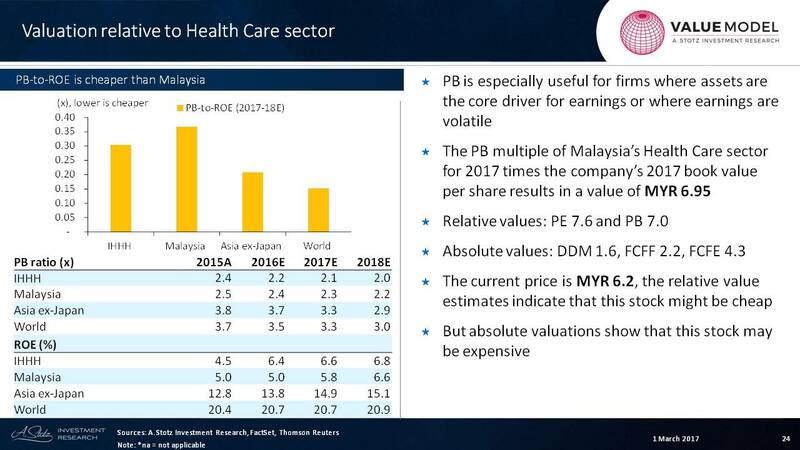 The price-to-book multiple of Malaysia’s healthcare sector for 2017 multiplied by the company’s 2017 book value per share results in a value of MYR 6.95. We can round that up and say that for PE relative values are 7.6 and 7.0, and the absolute values are much lower. The current price is MYR 6.2, so the relative value estimates indicate that this stock might be cheap. But the absolute valuations show that this stock may be expensive. There’s a lot to look at from an analyst’s perspective. we may adjust and go in deeper on this to try to understand the discrepancy. Let’s just look at the sensitivity for a moment. Again, I look at sales growth, gross margin, discount rate and terminal growth to try to understand the sensitivity. What we can see is that EPS growth can feel a large impact on these fronts. 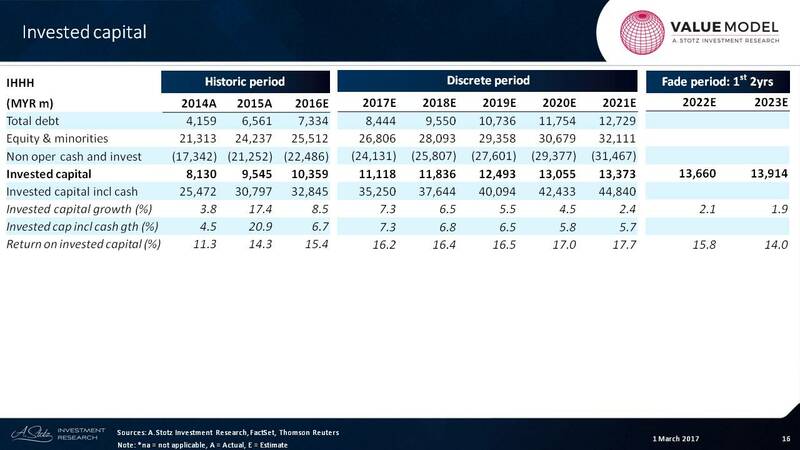 The gross margin of this company is very high but even a small change of even +5% or -5% can cause the EPS to go from 20.8% to 5.6% on the downside. But what we can see is that the range of values is pretty stable. Now, the PEG ratio is one I always watch for and that’s a little bit tricky, because it’s a very volatile measure. From this we can get a picture of what will happen when we change the different factors. When we change the discount rate, we can see very little change. So maybe we could widen this a little bit and see what that would cause. And the terminal growth rate provides very little change from that. There you have it! That’s IHH Healthcare. I hope you could learn from that.